I’m at the Asian American Journalists Association’s annual convention this week, a time for personal reflection. Why didn’t I become a doctor or lawyer? From Orwell’s “Why I Write:” “From a very early age, perhaps the age of five or six, I knew that when I grew up I should be a writer.” Me too, in San Francisco’s Fillmore district. But there was always that TV in the background. Since then, I’ve had some successes and many failures. But no more than a good baseball player who bats .300. And fails 70 percent of the time. It’s even tougher in an all-white profession like journalism in all its forms–radio, TV, newspapers. Everywhere I worked, I was usually the only Asian American, if not the only person of color in the room. And Filipino? I didn’t see any. All that was true in Dallas 35 years ago, when I worked with a guy named Scott Pelley. My real “Jackie Robinson” moment may have been the time I said, “It’s ‘All Things Considered,’ I’m Emil Guillermo,” as one of the hosts of NPR’s flagship show in 1989. I was the first Asian American to serve as a regular senior host. 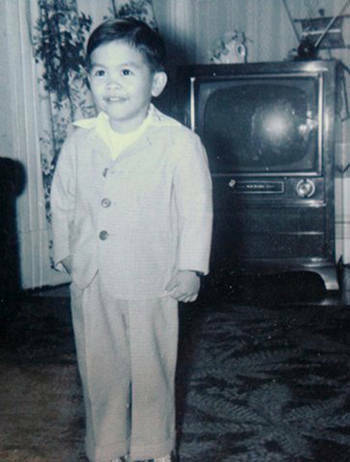 But I wasn’t the first Asian American to anchor a national news program. That would be Connie Chung, when she anchored at CBS. In the past, I’ve joked about being the male Connie Chung. But by ethnicity, in terms of hosting or anchoring a national news show, I would be the first Filipino American, male, female, or transgender. When I left that job, I realized the limitations of doing the news straight. With hairspray. The stories that meant the most to me, that I was proud to have done, were always the ones about Asian Americans or Filipino Americans. If I didn’t speak out and fight to do those stories, no one else would have. And the stories would generally go untold. At KRON, when it was the NBC affiliate in San Francisco, I had to fight to cover the assassination of Benigno Aquino, the husband of Cory, and the leader of the anti-Marcos movement in the Philippines. It was 32 years ago this month. I was the only Filipino in the newsroom. Armed with the 1980 Census detailing the number of Filipinos in California, I persuaded the news director to send me to Manila. 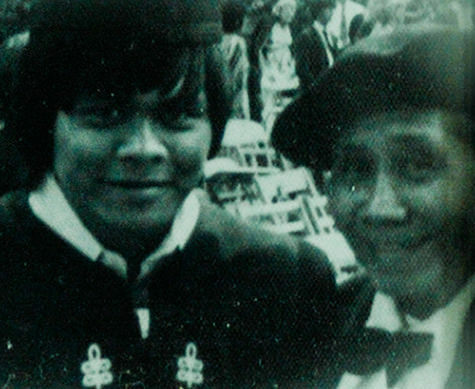 At NPR, I had to fight to tell the story of Manuel Fragante, an American Filipino, who was fired from his job because he had a thick Filipino accent. His case on accent discrimination went all the way to the Supreme Court–which refused to hear his appeal. My producers finally let me do the story–once it was covered by the beat reporter for the New York Times. I wanted to be a columnist. Like Chicago’s Mike Royko. Or like Boston’s Ellen Goodman. (We shared initials and a Harvard pedigree). But an Asian American columnist? They make those? Rare diseases are more common. The majority of my columns were commentaries on the Asian American experience. But there was only one place where I could do that on a regular basis. The ethnic media, the underground media of our time. I was on my way. From January 1995 to the time Asian Week pulled the plug in early 2010, I wrote about a thousand words a week–“Emil Amok” on the issues and stories important to Asian America. Sometimes seriously, sometimes with a fun tweak. But always amok. It’s the middle name on my driver’s license. But the Malay term aptly described my state, where a pent up sense of everything just had to come out. Was I angry? No, I was amok. Writing in a “murderous frenzy”? I only killed dangling participles and bad stereotypes. The column was simply my way to make sure people knew that Asian Americans weren’t voiceless–on anything that mattered. But by 2010, “Emil Amok” needed a new home. At the annual AAJA convention (held that year in Los Angeles), I bumped into an acquaintance I’d known for years, Margaret Fung of the Asian American Legal Defense and Education Fund. In an era when non-profits are doing more to support journalism, it seemed natural to migrate the column to AALDEF. Now, nearly five years later, the streak of 20 years writing a weekly column on Asian American issues continues on the AALDEF site. Twenty years, about a million or so words. Because if it wasn’t done, everyone would just assume we were all silent. We’re not. But when you rarely see an Asian American face on a talk show, an op-ed page, or as an analyst or regular news columnist anywhere, you know there are still gatekeepers in our society who believe Asian Americans just don’t count. On an elevated level, what I do is more than just a column, more essay. And shooting high, as the title of this piece suggests, the standard bearer is George Orwell, of course. While the filter is me, I don’t see it as just my experience. It’s all of ours. While I may not speak for Asian America (to answer those of you who say, “Who elected you, smarty pants?”), I do have a sensitivity to the experiences we all share. And so to coincide with the Asian American Journalists Association 2015 annual convention– celebrating the importance of the journalists’ role in our community–here’s a short list of some of my more memorable “Emil Amok” columns, or “blogumns,” since 2010 for the AALDEF blog that I feel are mostly humbug-free. By far, I consider the best column to be my exclusive interview with the killer of Vincent Chin, Ronald Ebens. He never spent a day in prison for the murder, but says he thinks of Chin every day. I talked to him in 2012. And then I did a second interview this year, when the unpaid judgment on the civil suit against him continues to grow close to $10 million. As we go through the 50th year celebrations of America’s march to equality, my columns on the March on Washington and the MLK “I have a Dream Speech,” and on Selma marcher Vincent Wu are important markers that Asian Americans are part of the legacy. It hasn’t been easy being an Asian American in journalism. Here I talk about my journey in the media, and my NPR period. Transgressions against Asian Americans. There are lots of them every day. Hardly any of them are mentioned in the mainstream. But they’re all noticed, because they all cut deeply. Milena Clarke knows about them. And so does a perp like Rush Limbaugh. And most of the time, Asian Americans just take it. They hold it in. They don’t go amok. I write a lot about my father. He loved to go to the horse races. But he wouldn’t recognize the game today. Every time an unarmed person of color is shot and killed, I think of my 26-year-old cousin Stephen, gunned down in San Francisco. His killer was never charged. Do Asian American lives matter? Pop culture anyone? It’s the incubator of stereotypes. Dogeater jokes in “Anchorman 2” just seemed gratuitous. This year’s “Fresh off the Boat” got us back on the right track. But just when you think all is well, there’s SNL’s “Asian American Doll” bit. Not funny. I can take a joke. But some jokes don’t elicit laughs, just rebuttals. Affirmative action is the wedge of the day, whenever a wedge user wants to invoke it. Now some Asian Americans have discovered it and they’re not going away. It’s the new Asian American civil war. On this 50th anniversary of the immigration reform that opened up the floodgates creating Asian American communities, why is it so hard to get further reforms through? And finally, when April 1st comes along, there is an excuse for something like this. Did I mention I was the class humorist at Harvard? I had a lot of competition, like Bill Gates, the funny guy who gave us Windows. Thank you for being part of the amokness.